Both Lori Lightfoot and Toni Preckwinkle are condemning anti-gay fliers that have surfaced on the city's South Side.The fliers surfaced Sunday on car windows at African American churches and have been discovered near the 95th street Red Line as well. NBC 5's Mary Ann Ahern has the details. Anti-gay fliers have surfaced in the Chicago mayor’s race with a photo of Lori Lightfoot and her partner on one side and on the back side, various messages. 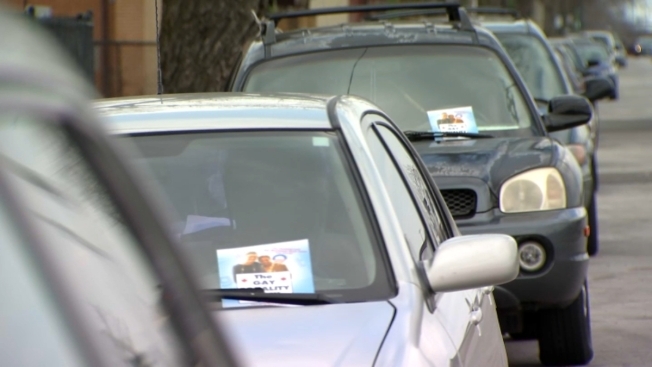 The fliers, first noticed on cars outside black churches on the city’s South Side, have expanded to cars parked near the 95th Street Red Line station. Should Lori Lightfoot win, she would be the city’s first lesbian mayor. With a little over two weeks until the runoff election, early voting has opened in all 50 wards and congressmen and unions are making their endorsements. NBC 5's Mary Ann Ahern has the details. Chicago police spokesman Anthony Guglielmi said no police report has been filed but the department is monitoring the activity. "The language in the flyers is detestable and has no place in Chicago," he said.